Two more staff members have departed Covington City Hall, continuing a trend that started late last year. On Tuesday, the city commission accepted the resignations of interim finance director David Mathews and senior accounting manager Robert Hagedorn. Their last day is Friday. The departures forced the city commission to adopt an ordinance that permits multiple holders of "interim" titles to sign city checks, including interim city manager Loren Wolff, interim senior accounting manager Jerome Heist, and interim operations manager Allison Hudson. City Manager Larry Klein resigned under pressure last month, following the departure of the city's finance director, operations manager, economic development manager, and IT director. 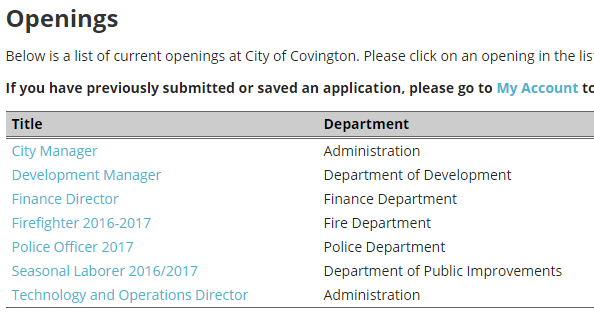 The exits have left the City of Covington with job openings in nearly all of its most important roles, particularly as budget season approaches. Loren Wolff, a local bankruptcy attorney who was appointed interim city manager after serving as chair of Mayor Joe Meyer's transition team, said that while there are multiple vacant spots in the city government, all active projects are still moving forward. “Some of the positions that have been left open have been combined or turned into interim positions, so the staff has been used to operating a little short-handed,” Wolff said of day-to-day operations. Wolff added that while positions are being filled with interim titles, they are actively recruiting and seeking people to fill all positions long-term, but not having a city manager is hindering the process slightly. The ordinance adopted Tuesday allowing new names to appear on city checks was amended to include the interim titles, so that a new ordinance would not have to be adopted each time someone resigns.